Sports cars, classic cars, antiques – these are all fun and valuable possessions allowing owners to create great memories while cruising the open road. Whether you use your car for short trips or long weekend getaways, owners of these types of cars often need to consider short-term or seasonal storage. For some, it's during a long trip for the peace of mind in knowing the car is safe. For others it's because the car is better off parked than on the roads in the winter time. Fill up the gas tank to keep moisture and condensation at bay. Put air in the tires. Most car experts recommend overinflating the tires by two to five PSI to compensate for expected loss of air. Change the oil and be sure to run it so that the fresh oil circulates through the engine, replacing the old oil. Cover the vehicle with a quality cover or, better yet, park it indoors or in a garage. If possible, start the engine and take it for a quick drive every couple of weeks. While it might be ideal to have it nearby in your garage, if you own other vehicles or a garage full of bicycles, children's toys, lawn equipment, or boxes, it may not be possible. Further if you don't have a garage at all, it may be even more critical to find a storage facility where your car will be locked up tight and safe, however, in an easily accessible location. When searching for a storage facility for your seasonal car in Redlands, California, you have plenty of options. Vines Storage offers indoor storage units that not only keep vehicles safe from theft or damage, but also protects the car from environmental damage; such as dust, dirt, erosion, and rodents. The facility is extremely secure with an eight foot exterior wall, a manned entry gate, and security cameras that operate 24 hours a day, seven days a week. In addition to the comfort of knowing your car is safe and secure, Vines Storage also offers great access with convenient hours so you can access your vehicle, start it up, or tinker under the hood. 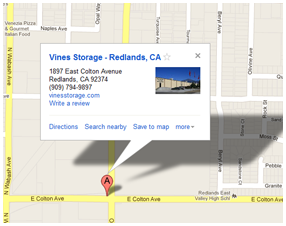 For more information about storing your car at Vines Storage, stop by for a tour today.